Today marks the long-anticipated release day for Grand Theft Auto V on PC. Since the game has been out for a year and a half on console, you might feel paying full list price is a bit silly. Fortunately, we got a special coupon to slash 24% off on GTAV for PC (that's $45.60).. The GMG deal is valid in the US and Europe (that's UK too), though for some reason Canadians are missing out as the game is not offered in their region. If you're in Canada, you can check out the alternative deal from France-based DLGamer, which currently has the game for 23% off. Console gamers aren't completely missing out on MKX deals. eBay powerseller "neogames" has a $10 discount for the Xbox One and PS4 consoles with free shipping. Best Buy doesn't have a discount available but is offering $45 in bonuses for $18 more, making a total price of $77.99. With that bundle, you'll also get a 2 year GamersClub Unlocked Membership for 20% off future games at Best Buy and a $15 gift card. Grand Theft Auto V (PC Download) - $45.60. Mortal Kombat X (Steam) - $45.60. Released today. List is $60. Deal expires April 17. The Premium Edition is $61.56 after coupon, while the Kombat Pack alone is $24. Mortal Kombat X (PS4, Xbox One) - $49.99. Released today. List is $60. Free shipping. Mortal Kombat X + Gamers Club Unlocked Membership Card + $15 Gift Card (PS4, Xbox One) - $77.99. Value is $105. Deal expires April 17. Bundle deal from Best Buy. Divinity: Original Sin (PC DVD) - $21.99. List is $40. Clearance sale from Best Buy. Xbox One Halo Master Chief Collection Bundle + 3 Month Xbox Live + Extra Controller - $349.99. List is $400. Bundle deal from Newegg's eBay page. StarDrive 2 (Steam) - $24. Released last Friday. List is $30. Deal expires April 14. Dark Souls II: Scholar of the First Sin (Steam) - $29.95. Released April 1. List is $50. Pillars of Eternity Hero Edition (Steam) - $32.84. Released March 26. List is $45. Battlefield: Hardline (Origin) - $44.99. Titan Souls (Steam) - $10.53. Releases April 30. List is $15. Deal expires April 14. Magicka 2 (Steam) - $11.24. Releases May 26. List is $15. Final Fantasy XIV: Heavensward (PC Download) - $29.99. Releases June 23. List is $40. EA SPORTS Rory McIlroy PGA Tour (PS4, Xbox One) - $52.99. Releases June 30. List is $60. Deal expires April 16. Cities: Skylines Deluxe Edition (Steam) - $29.59. Total War: Attila (Steam) - $28.49. Risen 3: Titan Lords (Steam) - $26.80. Risen Franchise Pack (Steam) - $16.00. List is $40. Deal expires April 17. Borderlands 2 Complete Edition Bundle (Steam) - $14.24. Saints Row: Gat Out of Hell (Steam) - $13.60. List is $20. Deal expires April 17. Sacred Franchise Pack (Steam) - $12.00. List is $30. Deal expires April 17. Saints Row IV - Game of the Century Edition (Steam) - $12.00. Call of Duty: Modern Warfare 3 (PC DVD) - $11.99. List is $40. Deal expires April 18. Tom Clancy's Splinter Cell Blacklist (PC DVD) - $7.99. Dead Island Franchise Pack (Steam) - $6.00. Dead Island Riptide Complete Edition (Steam) - $4.00. Dead Island GOTY Edition (Steam) - $4.00. Deus Ex: Human Revolution (PC DVD) - $2.99. List is $5. Deal expires April 18. Xbox Live 12 + 1 Month Gold Membership - $41.99. List is $60. Deal expires April 20. Super Smash Bros. (Wii U) - $44.96. Middle-earth: Shadow of Mordor (Xbox One) - $24.99. inFAMOUS Second Son (PS4) - $19.99. Deception IV: Blood Ties (PS3) - $19.99. Watch Dogs (PS4, Xbox One, Xbox 360, PS3, Wii U, Uplay) - $19.99. Bound by Flame (PS4) - $17.99. Drakengard 3 (PS3) - $16.99. Plants vs. Zombies Garden Warfare (Xbox One, Xbox 360) - $14.99. Borderlands: The Pre-Sequel (PS3, Xbox 360 - Pre-owned) - $12.99. Ni no Kuni: Wrath Of The White Witch (PS3) - $6.99. 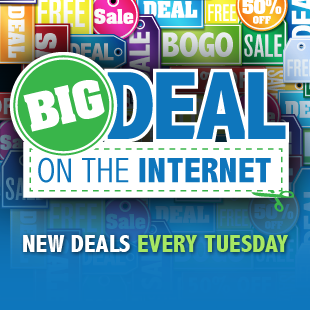 The weekly "Big Deals on the Internet" is brought to you by the crew from Dealzon. Want to save money on game deals? Check in every Tuesday at 5:30PM Eastern for the latest deals. Feedback? Let us know in the comments!